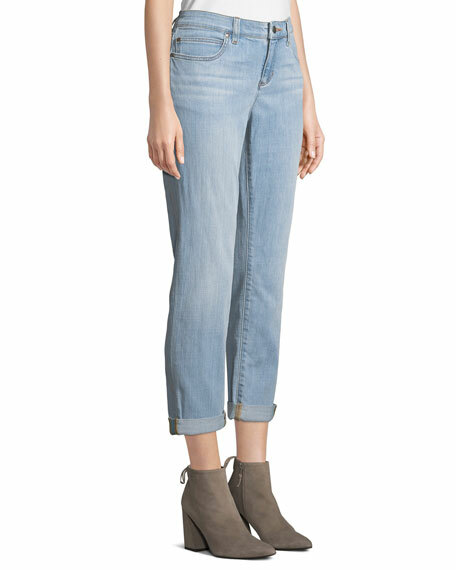 Eileen Fisher faded denim stretch jeans. Approx. measurements: 11" rise, 28" inseam, 39" outseam, 16" leg opening. Straight legs; boyfriend fit may be rolled up or down. Cropped and cuffed above the ankle. Current/Elliott "The Fling" boyfriend jeans in worn medium blue wash. Approx. measurements: 9.5" rise; 28" inseam. Five-pocket style. Relaxed, straight legs. Cuffed hem. Button/zip fly; belt loops. Cotton. Imported. Model's measurements: Height 5'10"/177cm, bust 33"/84cm, waist 25.6"/65.2cm, hips 35.8"/91cm, dress size US 2-4/FR 34-36. Helmut Lang Re-Edition "Painter" boyfriend-style jeans with paint-splatter. Mid-rise; button-zip fly. Five-pocket style. Relaxed fit through bootcut legs. Cotton. Made in USA of imported materials. Model's measurements: Height 5'10"/177cm, bust 33"/84cm, waist 25.6"/65.2cm, hips 35.8"/91cm, dress size US 2-4/FR 34-36.